Design: This study is a retrospective analysis of 81 eyes. Methods: Patients with refractory open-angle glaucoma underwent stand-alone 360° ab-interno trabeculotomy using the TRAB360 device. Effectiveness was determined by reduction in medicated IOP and the use of medications from baseline. Safety was determined by the rate of adverse events and secondary surgical interventions. The time points assessed were baseline and postoperative day 1, week 1, and months 1, 3, 6, and 12. A subgroup analysis was performed on eyes with medicated preoperative IOP values of ≥25 mmHg. Results: The reductions in IOP from 1 day to 12 months postoperatively were statistically significant compared to baseline values. The mean reduction in IOP at 12 months was 7.3±6.7 mmHg from baseline. At 12 months, 59% eyes achieved ≥20% reduction in IOP and IOP <18 mmHg with the same or fewer numbers of IOP-lowering medications compared with those at baseline. The mean number of IOP-lowering medications was reduced from 1.7±1.3 at baseline to 1.1±1.0 at 12 months. At 12 months, 67% of eyes with preoperative IOP values of ≥25 mmHg achieved ≥20% reduction in IOP and IOP <18 mmHg with the same or fewer numbers of IOP-lowering medications compared with those at baseline. The most common adverse event for all eyes was mild, transient hyphema (57 eyes). During the first year after the procedure, 20 (25%) eyes were considered failures since they required reinterventions. Conclusion: Trabeculotomy using the TRAB360 device resulted in significant IOP reductions up to 1 year with a favorable safety profile. The device is an effective stand-alone MIGS procedure for patients with refractory POAG. Refractory glaucoma patients present additional challenges to the clinicians in terms of treatment strategy decisions. These patients often require the use of several different types of treatment. A step-wise approach starting with less-invasive methods to more invasive techniques may be required (eg, beginning with medications; progressing to Schlemm’s canal-based minimally invasive procedures, microstents, trabeculotomy, and trabeculectomy/tube shunt, and finally filtration surgery/tube shunts).1,5 Patients with refractory glaucoma must be carefully managed and the broadest possible options preserved so that alternative treatments can be implemented, if needed, to prevent further optic nerve damage and vision loss. The current study evaluated postoperative outcomes of MIGS with 360° ab-interno trabeculotomy using the TRAB360 device (Sight Sciences, Inc., Menlo Park, CA, USA) as a stand-alone procedure in a consecutive series of patients with refractory POAG who had a medicated, preoperative IOP ≥18 mmHg. This study evaluated patients treated in a real-world, high-volume, tertiary-referral clinical practice setting. This was a retrospective study of 69 patients with refractory glaucoma undergoing ab-interno trabeculotomy using the TRAB360 device. This consecutive series included 81 eyes (one eye of 57 patients and both eyes of 12 patients) that had several types of glaucoma (POAG, pigmentary glaucoma, congenital glaucoma, neovascular glaucoma, and others; Table 1). The study was conducted at a single center (Dean McGee Eye Institute) and approved by the University of Oklahoma Institutional Review Board. The institutional review board waived the need of patients’ consent for this retrospective chart review. The data review was performed in compliance with the Declaration of Helsinki, and personal identifiers were masked to ensure patients’ confidentiality. Abbreviations: POAG, primary open-angle glaucoma; CPC, cyclophotocoagulation; w/, with; w/o, without; ECP, endoscopic cyclophotocoagulation. 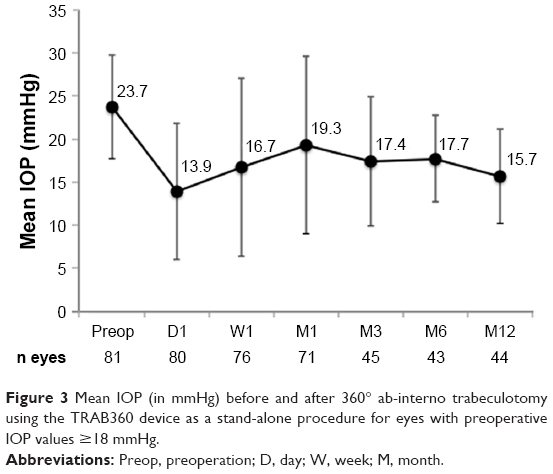 Patients underwent stand-alone 360° ab-interno trabeculotomy using the TRAB360 device (Sight Sciences, Inc.; Figure 1).6,7 Eyes were included in the analysis if they had a medicated preoperative IOP ≥18 mmHg and had follow-up data available at ≥1 month. To assess the efficacy of the device in patients with a higher preoperative IOP, a subgroup analysis was conducted in 26 eyes from 26 patients with baseline IOP values ≥25 mmHg. The time points assessed were baseline and 1 day, 1 week, and 1, 3, 6, and 12 months postoperatively. A single measure of IOP without washout was taken using a Goldmann applanation tonometer by the first author (SRS) at each visit with a few measurements reported by the referring doctors. Notes: The device consists of a handpiece with a trabeculotome, a control wheel for advancing and retracting the trabeculotome, and a locking mechanism. Reproduced with permission from Sight Sciences, Inc., http://sightsciences.com.23 Images were used with permission. A cannula was advanced across the anterior chamber toward the nasal iridocorneal angle through a clear corneal incision. A gonioprism was applied at this time. 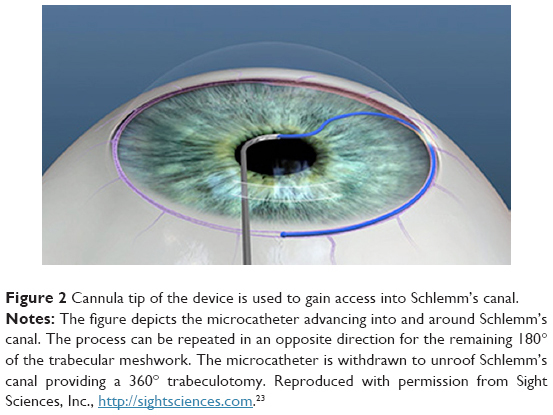 The cannula tip was used to pierce the trabecular meshwork and gain access into Schlemm’s canal (Figure 2). The microcatheter was advanced into and 180° around the canal. The microcatheter was then withdrawn to tear trabecular meshwork exposing the external wall of Schlemm’s canal, providing an up to 180° trabeculotomy. These steps were repeated in the opposite direction for the remaining 180° of meshwork, creating a 360° transluminal trabeculotomy. A 360° trabeculotomy was typically achieved in the eyes included in the study. Figure 2 Cannula tip of the device is used to gain access into Schlemm’s canal. All the patients were taken off their IOP-lowering medications after the surgery. The IOP-lowering medications were reintroduced as required in physician’s judgment. Loteprednol ophthalmic gel was administered for twice a day for 3 weeks, and fluoroquinolone eye drops were administered four times a day for 1 week. Effectiveness was determined by a reduction in medicated IOP and reduction in the use of medications from baseline. Safety was determined by the rate of adverse events and secondary surgical interventions. The proportion of eyes achieving ≥20% reduction in IOP at 12 months and IOP <18 mmHg with the same or fewer numbers of IOP-lowering medications compared with those at baseline was reported. The proportion of eyes requiring secondary surgical reintervention was reported as failures. For the patients in whom both eyes were included in the study, each eye was considered independent for endpoint analysis. Trabeculotomy being a surgical intervention, contralateral effect of treatment was overruled. Descriptive statistics were used to summarize the data. Patients who required secondary surgical interventions to treat their glaucoma or surgical interventions that could affect IOP were censored from the analysis from the time of the surgical intervention. Ninety-five percent (95%) CI of the percent per binomial distribution were calculated for the changes over time in the categorical values. In all, 95% CIs of the mean per t-distribution were calculated for change over time in the numeric values. SAS (version 9.3; SAS Institute Inc., Cary, NC, USA) was used for analysis of the data. A total of 81 eyes were treated using the TRAB 360 device as a stand-alone procedure. At 1 year, 44 (54%) eyes were available for analysis of endpoints related to medicated IOP and 41 (51%) eyes were available for the analysis of endpoints related to use of medication. For 41 eyes that had both IOP and medication use data at 1 year, the proportion of eyes achieving ≥20% reduction in IOP at 12 months and IOP <18 mmHg with the same or fewer numbers of IOP-lowering medications compared with those at baseline was calculated. The missing data for remaining eyes were due to patients being sent back to their referring eye doctor and failure in getting the updated records or due to patients who were censored from analysis due to secondary surgical interventions. Demographics and disease characteristics for this refractory glaucoma patient cohort are shown in Table 1. The average age of the patients was 64.0 years, and 50.7% of the patients were females. Most of the eyes (54/81, 66.7%) were pseudophakic, and the vast majority (67/81, 82.7%) was diagnosed with POAG. Medicated IOP at baseline was ≥18 mmHg for all eyes. Prior to the trabeculotomy procedure, more than one-third (30/81, 37.0%) of the eyes were being treated with three or more IOP-lowering medications. Nearly two-thirds of the eyes (50/81, 61.7%) had undergone a prior glaucoma procedure, with laser trabeculoplasty being the most common (42/81, 51.9%). 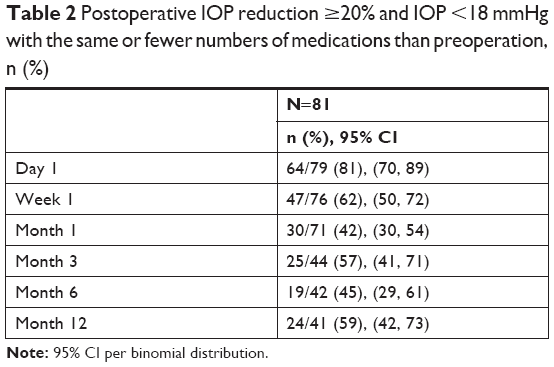 Mean IOP reductions from preoperative values were statistically significant at all postoperative visits (Figure 3). At 12 months, the mean IOP reduction from baseline was 7.3±6.7 mmHg and 59% eyes (24/41) achieved ≥20% reduction in IOP and IOP <18 mmHg with the same or fewer IOP-lowering medications compared with baseline (Table 2; Figure 4). Figure 3 Mean IOP (in mmHg) before and after 360° ab-interno trabeculotomy using the TRAB360 device as a stand-alone procedure for eyes with preoperative IOP values ≥18 mmHg. Abbreviations: Preop, preoperation; D, day; W, week; M, month. Note: 95% CI per binomial distribution. 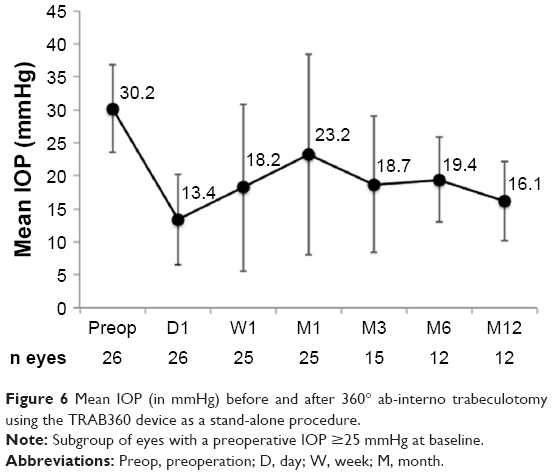 Figure 4 Mean IOP change from preoperation (in mmHg) after 360° ab-interno trabeculotomy using the TRAB360 device as a stand-alone procedure. Notes: *Statistically significant decrease based on 95% CIs. Statistics were not performed on Day 1 and Week 1 due to the possibility that the IOP values can be confounded by medication administered postoperatively. Abbreviations: D, day; W, week; M, month. A reduction in the number of ocular hypotensive medications needed was observed following the procedure from a mean of 1.7±1.3 at baseline to 1.1±1.0 at 12 months (Figure 5). At 12 months, 37% (15/41) of the eyes still did not require IOP-lowering medications. 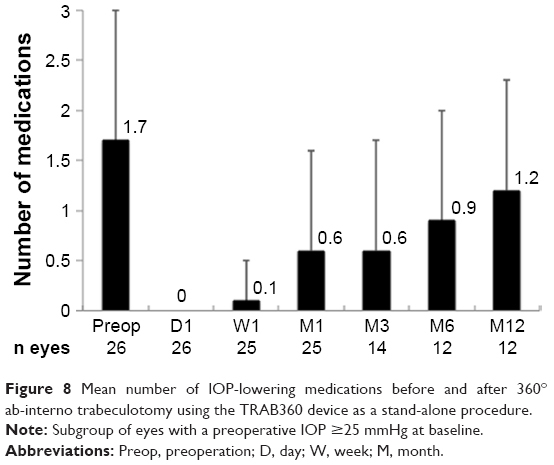 Figure 5 Mean number of IOP-lowering medications before and after 360° ab-interno trabeculotomy using the TRAB360 device as a stand-alone procedure. The subgroup analysis for patients with medicated IOP values of ≥25 mmHg at baseline showed clinically meaningful reductions in IOP following the trabeculotomy procedure that were sustained for 12 months (Figure 6). The mean IOP was reduced from 30.2±6.7 mmHg at baseline to 16.1±6.0 mmHg at 12 months. Owing to their high baseline IOP, even higher proportions (8/12 eyes, 67%) of these eyes, compared with the full cohort of eyes, achieved ≥20% or greater reduction in IOP and IOP <18 mmHg with the same or fewer IOP-lowering medications than baseline (Figure 7). The reductions in the mean number of medications showed a similar trend in these eyes with a higher baseline IOP compared to those from the full cohort of eyes (Figure 8). Figure 6 Mean IOP (in mmHg) before and after 360° ab-interno trabeculotomy using the TRAB360 device as a stand-alone procedure. 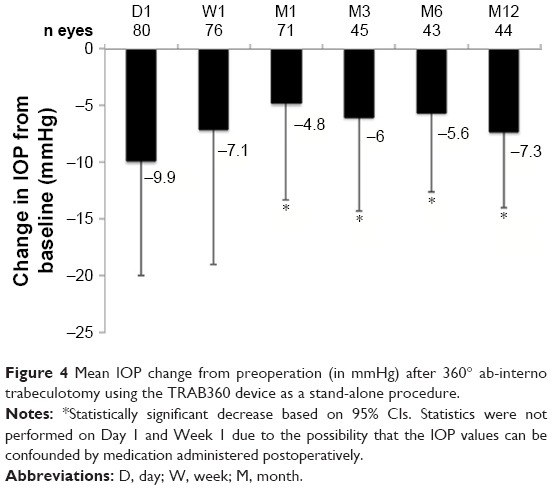 Note: Subgroup of eyes with a preoperative IOP ≥25 mmHg at baseline. 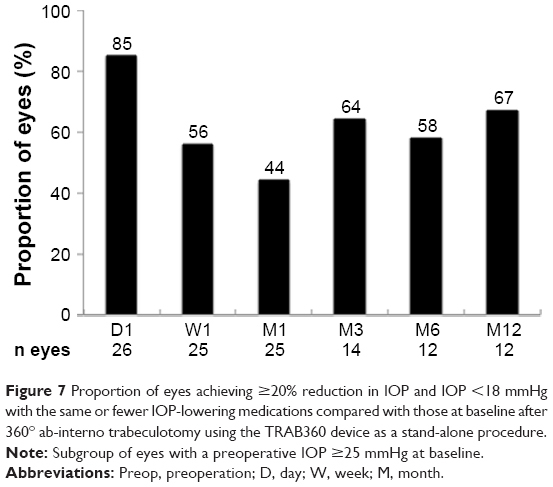 Figure 7 Proportion of eyes achieving ≥20% reduction in IOP and IOP <18 mmHg with the same or fewer IOP-lowering medications compared with those at baseline after 360° ab-interno trabeculotomy using the TRAB360 device as a stand-alone procedure. 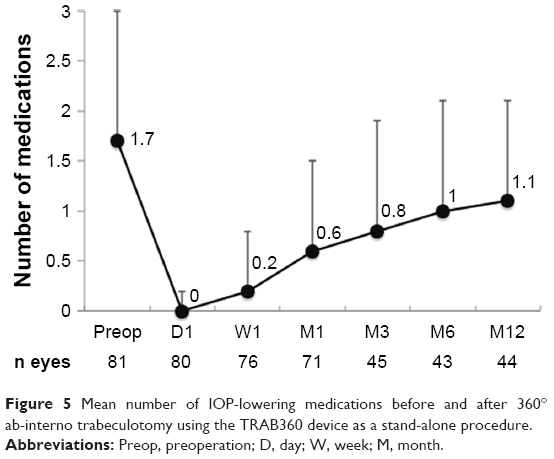 Figure 8 Mean number of IOP-lowering medications before and after 360° ab-interno trabeculotomy using the TRAB360 device as a stand-alone procedure. 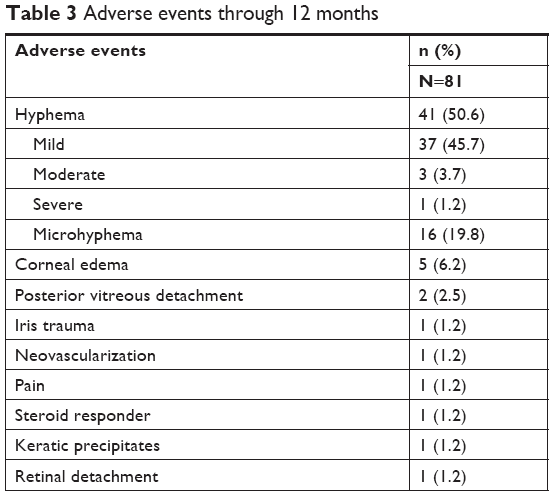 The most common adverse event following the procedure was transient hyphema, which resolved within an average of 36.1 days (Table 3). In most instances (53/57; 93% of hyphema), this reaction was mild. The majority of the clinically significant hyphema was resolved by postoperative week 1. In all, 16 of the 57 eyes with hyphema were classified as having microhyphema. Transient, corneal edema was reported in five (6.2%) eyes. 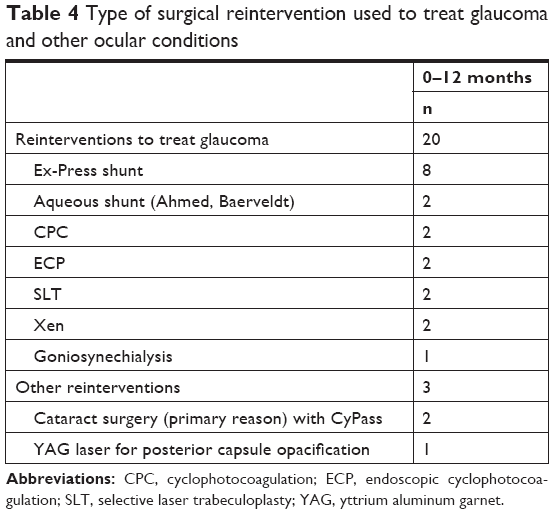 During the first year after the procedure, 20 (25%) eyes were considered failures since they required reinterventions, the most common being implantation of the Ex-Press shunt (8/20; Table 4). Abbreviations: CPC, cyclophotocoagulation; ECP, endoscopic cyclophotocoagulation; SLT, selective laser trabeculoplasty; YAG, yttrium aluminum garnet. This study demonstrated the efficacy of stand-alone 360° ab-interno trabeculotomy using the TRAB360 device in a cohort of patients with refractory glaucoma. Many of these patients had undergone prior surgeries to treat their glaucoma. Clinically meaningful reductions in IOP and medication use were observed up to 12 months. The 360° ab-interno trabeculotomy using the TRAB360 device produced an acceptable safety profile. A total of 56 (69.1%) eyes had adequate control of IOP up to 1 year following the procedure without reintervention. Of those that did require reintervention, many had a less-invasive procedure (MIGS or laser). A smaller subset of these eyes required more invasive trabeculectomy, tube, or shunt procedures. In the refractory glaucoma patients, the decision of treatment strategy for each individual is important as there is an increased sense of urgency compared with the patients who respond to treatment. These treatment decisions are based on the extent of optic nerve damage, visual field loss, and the degree of IOP elevation. The physician often does not have the luxury of waiting to see if a patient’s IOP will improve over time. Target IOP in these patients is typically lower than for mild–moderate POAG.22 In the clinical setting, this can lead to more aggressive reintervention. The TRAB360 device provides several advantages for the treatment of glaucoma. Using an ab-interno approach, the device allows for access to 360° of Schlemm’s canal. Keeping the target area restricted to the canal helps to preserve the patient’s options for future interventions. The trabeculotomy procedure is implant free and sutureless, which helps to minimize complications. It is also blebless, which allows for easier management for long term compared with more invasive procedures. This 360 blebless ab-interno trabeculotomy can be performed as a stand-alone procedure or as one combined with cataract surgery. The single-handed design of the instrument provides good control during the procedure. The current study was limited by its retrospective, nonrandomized, uncontrolled design. The study encompassed a relatively small sample size at only one surgical center. A wide variety of glaucoma types were included in the analysis. However, the study does provide real-world data on the safety and efficacy of the TRAB360 device. The TRAB360 was an effective stand-alone MIGS procedure for patients with moderate-to-severe refractory glaucoma. Surgical intervention using the device was associated with a favorable efficacy (eg, sustained reductions in IOP and medication use) and safety profile. The authors would like to thank Robert Stamper, MD, for providing editorial assistance on the manuscript, Yi-Jing Duh, PhD, for performing the statistical analysis of the data, and Julie Crider, PhD, for her assistance in preparing and editing the manuscript. This research was supported by a grant from Sight Sciences, Inc.
Dr Sarkisian is a consultant/advisor to and equity owner in Sight Sciences, Inc. The authors report no other conflicts of interest in this work. American Academy of Ophthalmology. Preferred Practice Pattern®. Primary Open-Angle Glaucoma. San Francisco, CA: American Academy of Ophthalmology; 2015. Lavia C, Dallorto L, Maule M, Ceccarelli M, Fea AM. Minimally-invasive glaucoma surgeries (MIGS) for open angle glaucoma: a systematic review and meta-analysis. PLoS One. 2017;12(8):e0183142. Brandão LM, Grieshaber MC. Update on minimally invasive glaucoma surgery (MIGS) and new implants. J Ophthalmol. 2013;2013:1–12. Vold S, Ahmed II, Craven ER, et al. Two-Year COMPASS trial results: supraciliary microstenting with phacoemulsification in patients with open-angle glaucoma and cataracts. Ophthalmology. 2016;123(10):2103–2112. Richter GM, Coleman AL. Minimally invasive glaucoma surgery: current status and future prospects. Clin Ophthalmol. 2016;10:189–206. Sarkisian S, Allan E. New Way for Ab Interno Trabeculotomy. San Diego, CA: American Society of Cataract and Refractive Surgery; 2015. Sheybani A, Ahmed IK, Samples J. Glaucoma research and clinical advances 2016 to 2018. In: Knepper PA, Samples JR, editors. Glaucoma Research and Clinical Advances 2016 to 2018. Amsterdam, Netherlands: Kugler Publications; 2016. Baudouin C, Labbé A, Liang H, Pauly A, Brignole-Baudouin F. Preservatives in eyedrops: the good, the bad and the ugly. Prog Retin Eye Res. 2010;29(4):312–334. Rosin LM, Bell NP. Preservative toxicity in glaucoma medication: clinical evaluation of benzalkonium chloride-free 0.5% timolol eye drops. Clin Ophthalmol. 2013;7:2131–2135. Landers J, Martin K, Sarkies N, Bourne R, Watson P. A twenty-year follow-up study of trabeculectomy: risk factors and outcomes. Ophthalmology. 2012;119(4):694–702. Weinreb RN, Aung T, Medeiros FA. The pathophysiology and treatment of glaucoma: a review. JAMA. 2014;311(18):1901–1911. Kashiwagi K, Matsubara M. Reduction in ocular hypotensive eyedrops by Ab Interno trabeculotomy improves not only ocular surface condition but also quality of vision. J Ophthalmol. 2018;2018:1–8. Tan YL, Tsou PF, Tan GS, et al. Postoperative complications after glaucoma surgery for primary angle-closure glaucoma vs primary open-angle glaucoma. Arch Ophthalmol. 2011;129(8):987–992. Vijaya L, Manish P, Ronnie G, Shantha B. Management of complications in glaucoma surgery. Indian J Ophthalmol. 2011;59(7):131–140. Ayyala RS, Chaudhry AL, Okogbaa CB, Zurakowski D. Comparison of surgical outcomes between canaloplasty and trabeculectomy at 12 months’ follow-up. Ophthalmology. 2011;118(12):2427–2433. Rulli E, Biagioli E, Riva I, et al. Efficacy and safety of trabeculectomy vs nonpenetrating surgical procedures: a systematic review and meta-analysis. JAMA Ophthalmol. 2013;131(12):1573–1582. Melancia D, Abegão Pinto L, Marques-Neves C. Cataract surgery and intraocular pressure. Ophthalmic Res. 2015;53(3):141–148. Sato T, Kawaji T, Hirata A, Mizoguchi T. 360-degree suture trabeculotomy ab interno to treat open-angle glaucoma: 2-year outcomes. Clin Ophthalmol. 2018;12:915–923. Grover DS, Godfrey DG, Smith O, Feuer WJ, Montes de Oca I, Fellman RL. Gonioscopy-assisted transluminal trabeculotomy, ab interno trabeculotomy: technique report and preliminary results. Ophthalmology. 2014;121(4):855–861. Holló G, Katsanos A, Konstas AG. Management of exfoliative glaucoma: challenges and solutions. Clin Ophthalmol. 2015;9:907–919. Toshev AP, Much MM, Klink T, Pfeiffer N, Hoffmann EM, Grehn F. Catheter-assisted 360-degree trabeculotomy for congenital glaucoma. J Glaucoma. 2018;27(7):572–577. The Advanced Glaucoma Intervention Study (AGIS): 7. The relationship between control of intraocular pressure and visual field deterioration. The AGIS Investigators. Am J Ophthalmol. 2000;130:429–440. Sight Sciences. The TRAB360 Trabeculotomy System. Available from: https://sightsciences.com/us/products/trab-360/. Accessed December 18, 2018.